Like all story collections, a mixed bag. I might have given this a higher rating, but I was a little disappointed that some of the stories didn't seem to match the pictures. 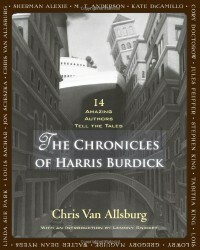 In fact, I'm a little disappointed that this anthology actually happened, as the enjoyment in The Mysteries of Harris Burdick is that of creating your own stories to go with the wonderfully evocative pictures. However, without that baggage, this is a pretty decent short story collection. I hadn't realized that Steven King's The House on Maple Street was based on a picture from The Mysteries--duh! I particularly liked Jules Feiffer's story about a demented children's illustrator.